Do you provide a coaching or consulting services? Do you need a unique brand positioning and a strong market presence? Do you want to attract more clients and get you on track to great sales? You are in the right place. Expand your own coaching practice to the next level with GURU WordPress theme. GuruBlog is created particularly for experts, life and business coaches, and trainers to boost their services and money flow. You will be able to set yourself apart your competitors. Ideal to start up your own coaching website and be more attractive to potential clients! A Responsive WordPress Blog Theme. Ad Optimized Magazine with Powerful Advertisement System. Great theme and even better support! Theme developer has offered better support than I have had with some programmers that I personally hired! Will recommend and purchase again from Strict Themes and Igor! Truth is, everything is great about this theme. Easy instructions, great looks and feel. 5 stars! Stylish magazine with review system. AD & Review ready magazine with portfolio. My overall experience with author and his work is SUPER! Super fast, easy and reliable! 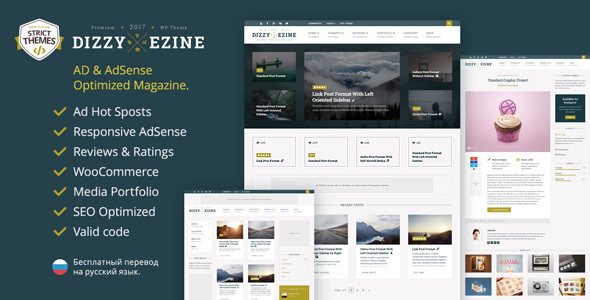 Simplicity without compromise to feature availability is what sets DizzyMag apart from other themes. While most themes are trying to do most of everything at once, DizzyMag of Strict Themes remains 'strict' to the basics, providing you with the useful tools and features you’ll need to run a WordPress site. I was actually surprise on how the settings are stripped down to basics after coming from another theme that overbears a longtime WordPress user like me with hundreds of settings to tweak for it to work properly. But don’t let its simplicity fool you! If you want to extend the design or functionality, simply pop a few CSS codes (which are BTW well commented) and you're done! And if you are stuck or have broken something, Mr. Igor is readily available to help you fix your problem. For me the support of the theme developer for this theme is an absolute bonus! DizzyMag of Strict Themes is truly a gem here at the Envato marketplace! Theme author is very responsive and is quick to give detailed support. Definitely recommend and look forward to purchasing more themes from him. Easy to install and very flexible. Documentation is comprehensive and the theme author is very fast to respond to any queries. Excellent! Incredibly quick responses, and solved my issues. I know many of my questions were complete novice questions, but I needed help, and StrictThemes delivered. Got me up and running fast, and for that I am very grateful. I am a tough critic with designers now-a-days - but this one is a plus. I will be buying from again! 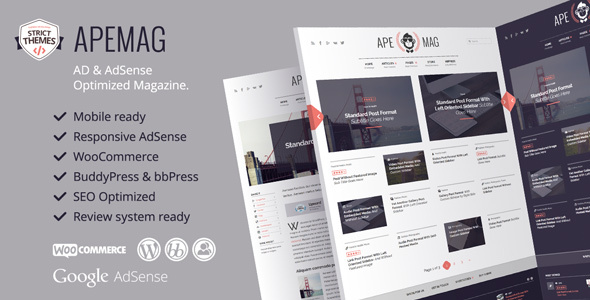 AD & AdSense Optimized Magazine. Not bad at all, It lets you create a social media site easily. Great theme, great support and easily the most beautiful theme I've ever had. Highly recommended. It's a wonderful theme that helps me realise my dream of creating my own beautiful website and the support from igor is great! After searching for weeks for the best wordpress theme for my site, I finally settled for The Truemag Wordpress theme. It is a cut above the rest and I mean the best! It really has everything I wanted, Ad Ready, Responsive, Retina Ready, SEO optimised... Woo Commerce ready and so easy to use. I am very pleased with it and would recommend it to anyone who is after an ALL INCLUSIVE theme to allow for an extremely flexible blog! Even with limited Wordpress knowledge, this theme is well documented and the author is quick to support where there is need. Thank you StrictThemes! Design Quality, Documentation and Customer Support...Awesome all the way! The Theme is really Great in all aspects and the author's Theme provide the best support that you can have in the market! Congratulation! I recommend and I'm really happy with the Theme and the service! Thanck's!!! All the above options! This theme is just fantastic as is the support you get! It's EXACTLY what I wanted and after purchasing a template that was buggy as heck, I searched again and found this one which was just new on the scene! It fit the bill perfectly and I'm SO glad I found it! Can't wait to launch my new website! Customer Support by Igor, in addition to code and design quality for the Truemag Theme are all reasons for scoring this a 5 star item! Great job all the way around! Awesome theme! Is everything I was looking for plus excellent support. Will buy from again! Structured Design and Very Flexible. Great theme! Amazing theme and a great customer service. Very much what I was expecting. This is the most beautifull theme i ever had in my life. Its so nice and i love it. Great scheme with the flexibility to be moulded to what ever you want. The documentation is very good and the support first rate. If I could make one suggestion it would be to add styling the top menu to the Theme Panel. This is a fantastic theme. I would highly recommend it! The user interface is very customisable and easy to use even for a beginner. To top that off, Igor (the theme designer) offers super fast and highly effective support to any question you may have. The only slight issue we had, is that the documentation is slightly outdated. However it is still usable and combined with the great support Igor offers, you will be up and running in no time. Excellent theme, easy to customize and very extendable. Well done! I have installed this them on SEO tool website (http://seoeh.com/) without any problems. Strict Themes has not just cool design and convenient backend but also instant support. The theme is highly customisable and very easy to use. Customer support is excellent! I love the design and it's user-friendly documentation. I'm a complete beginner, and still I was able to set it all up using the documentation and reading the support. Well done Igor! Just an overall excellent theme that is just what my client was looking for. Fast, helpful support as well. Out of the box the theme works perfectly! It was very easy to customize the color scheme and other elements. I have yet to come up with a question that is not covered by the documentation or not already answered in the comment/discussion page. The best part is that this theme allowed me to focus on content generation rather than messing about trying to figure out how to lay things out properly. A great, well-balanced and flexible theme. And quick useful customer support too! Excellent customer support, beautiful theme. Igor has been great to deal with. Very quick response to any question. The design is great and is easily customizable. Excellent design, coding and impeccable support (practically instant answers). StrictThemes offers enterprise solutions and support for the price of one theme. It's definitely the biggest bang for the buck purchase I've made. Really nice design with a lot of flexibility from within the Backpanel. Portfolio & Blog for Creatives. Multimedia Portfolio for Media Artists. Big thanks for your fast response. I bought about 10 themes here and i can say that your support its really great. Thanks so much. Hi, first of all, just wanted to thank you for your work and theme! I love it!! First off I'd like to say that overall I think this theme is fabulous. The flexibility in the admin panel with the visually beautiful photo centric layout is just wonderful. Awesome theme guys – really beautiful. Thanks, this will help! I am really impressed with your quick responses and patience with the learning curve I am experiencing.